"It's insanely easy to start a blog of your own..."
Following items by Derek Thompson and Bob Cohn, explaining why all-but-one parts of the Atlantic domain offer reader-comment sections, and then these two items by me on why I remain the lone holdout, a variety of responses. I wanted to add a voice of support to your “no comments” policy and relay one very appropriate anecdote. To be fair, many of the editors and writers did like it; not so much for the insight. My impression was that they were grateful to have confirmation that someone, anyone was actually reading the pieces that worked so hard to perfect. My feeling however is that there is more of a tendency for people now not to care about comment strings since the commentary almost never forwards the discussion and is usually a constant repetition of worn themes. I feel the same way about online comments as I used to feel about teacher evaluations and letters to the editor: if you’re not willing to sign your name, maybe you need to rethink or rephrase what you wrote. Or maybe keep it to yourself. It appears from the (negative) Reader Comments that you have posted that an awful lot of people have come to believe that they have a right, not only to have an opinion (they do) but also to have someone else publish that opinion in a place where they would like to see it (they do not). If what they have to say is so important, it isn't that expensive (less than $50 per year) to get their own website and publish their gems of wisdom there. I would add one other point: it's insanely easy to start a blog of your own, and comment from there. Most people who have anything worthwhile to say on anything resembling a regular basis do that. I rarely read comments or leave them on other websites for all the reasons you list, but when I do have something to say I write about it on my blog and, if it's something I think the original author should read, I send a link. [A reader complaining about a no-comments policy wrote:] "To say that open (unmoderated) forums become a place 'ruined by bullies, hotheads, and trolls' does not really represent a coherent argument to be against them. Should we shut down speaker's corner in London because of 'hot heads and bullies'? Or stop town halls stuffed with Tea Partiers because arguments may be too narrow-minded? " No, we shouldn't shut down speaker's corner in London, but I don't want to host it at my house, either. And I have a choice whether to attend a town hall stuffed with Tea Partiers. You have the choice of whom to host at "your house" (your blog), and I appreciate the current method of you deciding which comments to feature. It's hard for me to believe that this reader would actually enjoy wading through hundreds or thousands of unmoderated comments on every post, just in case there was a pony in there somewhere. Regarding Town Halls stuffed with Tea Partiers, this ain’t the same. You’re not running Town Meeting here and we’re not voting on the town budget (and our taxes) for next year. I’ve lived in New England and sat through town meetings that started during one day and continued on until Dawn with her rose-red fingers gently pushed aside the curtains of night and folks were still nickel and diming over the years road maintenance budget. Please not here thanks – at least unless and until whatever you are discussing means sticking your sticky fingers in my wallet, buster. 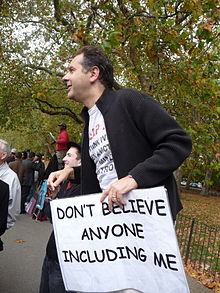 And I think Speaker’s Corner in Hyde Park is great and if that’s what I want I can go there. I don’t want it following me around, like a cloud of hungry bugs, from corner to corner to every (or even almost every) other corner I come to or cross. Anonymity plus the general tenor of the internet makes most comment sections a nightmare. It's deeply unfortunate, because it could be an excellent forum and source for new angles on a discussion, but with rare exceptions (T N-C's comment section is an example most of the time since it's aggressively moderated and he has smart readers), comment sections wind up in lowest common denominator attacks and straw man arguments at best (ad hominem attacks and spam about making $$$ working from home at worst). In general comments sections remind me of some of the neighborhood groups I've participated in over the years: they become dominated by those who are willing to invest tremendous amounts of time in making the experience miserable for everyone else and driving them away. I agree that an unmoderated comment section is undesirable. It’s not just the hatred, ugliness and personal attacks that seem to take up most of the space on these sections. Even more than those, it’s the snarky comment made by people who agree with the original poster or columnist, the people coming up with supposedly clever sayings and the like. I’m often interested in what readers think of the post I just read, but I shouldn’t have to wade through dozens of these useless posts in order to find the one or two comments that actually try to shed some light on the topic. The ideal solution is to have a staffer moderate and limit posts to those with some real content or merit. The alternative is to do what you do (but perhaps more frequently)—periodically devote space in the column to excerpts from worthwhile reader responses. If you were to run a moderated comments section with your own participation, then you should probably charge tuition. Coates has done a great thing, but it’s very labor intensive, as he often says. Easy as pie to set one up via Tumblr or its ilk; then it needs no more than a link to each of your posts, a block quote or two, and an open comment section. And then we'll see once and for all whether it turns into Prime Minister's Questions or an Arizona town hall, and to what good or ill.